The final mini season of Mad Men starts Sunday night and I’m sadder than Lois Sadler sent back to the switchboard. Not only do I think Mad Men is one of the best shows on television, but the emphasis on good dialogue makes it the perfect kitchen companion — looking up isn’t critical unless Pete and Trudy are doing the Charleston or Roger shows a little cheek. The tinkle of Don’s ice cubes, that satisfying SNAP each time Betty Draper closes her purse, Sally’s lisp turning into sullen teen monotone, the never-ending smarm of Harry Crane, the clacking typewriters, and terrific jazzy score… Mad Men, you’ve been a true pleasure. But let’s not leave the 1960s behind just yet, hm? 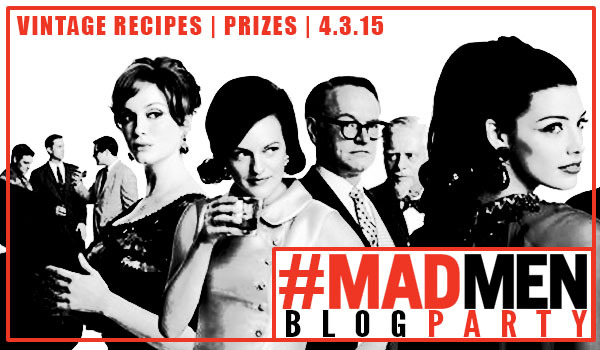 I know I wasn’t ready, so when the lovely and talented Carrie Burrill from Bakeaholic Mama asked if I’d like to participate in a Mad Men Blog Party & Giveaway, I couldn’t resist! 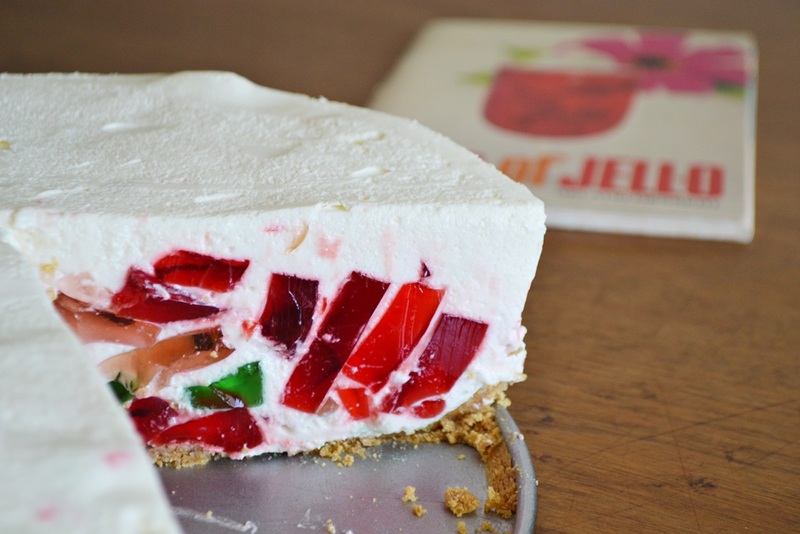 The Joys of Jell-O | Crown Jewel Dessert. Well, my amateur version of it. 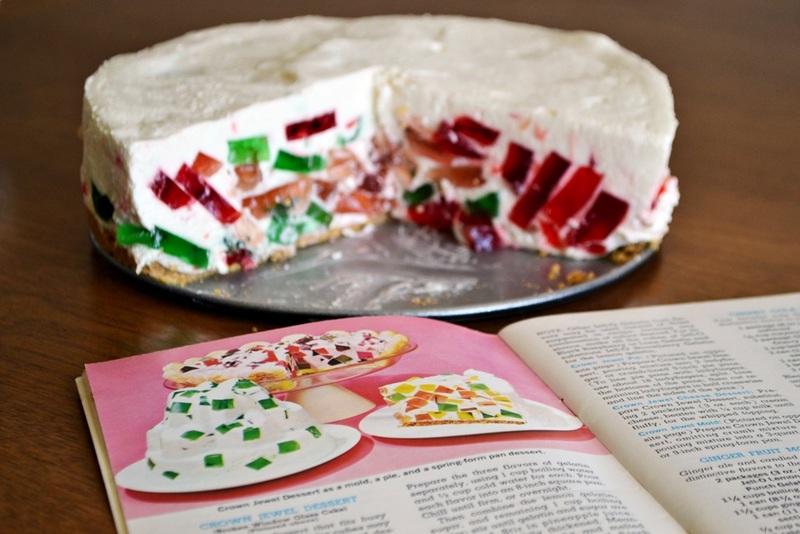 The concept reminded me a lot of the broken glass gelatin recipes (the recipe’s subtitle is “Broken Window Glass Cake”), but rather than calling for condensed milk it uses another boxed dessert — Dream Whip. You can substitute real whipped cream, but when you’re talking about a dish that calls for 4 boxes of assorted Jell-O, why stop there? Crown Jewel Dessert from The Joys of Jell-O. 1. Chilling the gelatin in 8-inch square pans as directed gives you thin sheets of gelatin that are almost impossible to cut into squares (hence my sad, thin rectangles). Next time I’d use a smaller square container (like a Tupperware) to get a thicker layer to work with. 2. I wanted the tall smooth sides you get from a spring-form pan, but because mine has a grooved lip around the edge, it made it very tricky to get my cake server neatly under the graham cracker bottom of each slice so I could (very carefully) lift it without the slice wobbling and breaking. Possible solutions include letting the cake sit at room temperature for a bit first so the crust is more willing, adding another envelope of plain gelatin to the Dream Whip mixture to make the cake extra-firm, or just using a pie pan or sheet pan. Despite it’s somewhat questionable appearance, I brought this into work and had no trouble finding testers — many of which told me how the taste swiftly and sweetly reminded them of childhood. Will you be tuning in Sunday night for the first of the final few episodes of Mad Men? Prepare the three flavors of gelatin separately, using 1 cup boiling water and 1/2 cup cold water for each. Pour each flavor into an 8-inch square pan. Chill until firm, or overnight. Combine the lemon gelatin, sugar, and remaining 1 cup of boiling water. Stir until sugar and gelatin are completely dissolved, then stir in pineapple juice. Chill until slightly thickened. While it chills, mix together the graham cracker crumbs and melted butter, then press into the bottom a 9-inch spring-form pan. Cut the firm gelatin into 1/2-inch cubes, then prepare the whipped topping according to package directions. Blend with the thickened lemon gelatin, then fold in the cubes of gelatin. Pour into the pan and refrigerate for at least 5 hours or overnight. When ready to serve, run a knife or spatula between the sides of the cake and the pan to loosen, then remove to the pan. If desired, frost top and sides with additional whipped cream. Click to view and print the recipe for Jell-O Crown Jewel Dessert. And here’s the giveaway! One lucky winner will receive a $100 gift card to ModCloth, one 4-quart vintage Pyrex mixing bowl, and one Alan Lee hand-crafted sapphire martini. The giveaway is open to U.S. residents only. Click here to enter via Rafflecopter Giveaway. 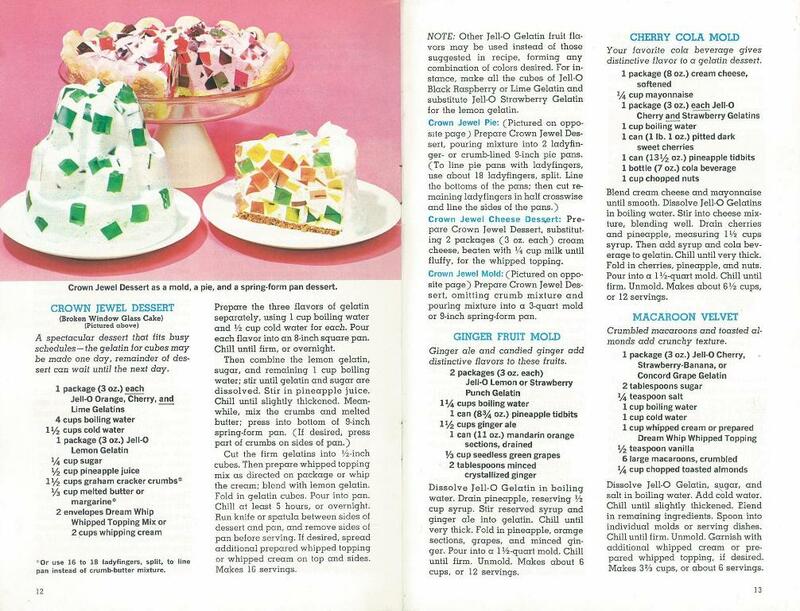 Want to see more retro recipe awesomeness? This is the perfect dessert to celebrate the Mad Men premiere. It’s so pretty. Aimee!! I am also very saddened about the finale of Mad Men. It has been a great show. I always saw it as a way to see what it was like when our parents were growing up. Secretly I always wanted Betty and Don to get back together! How have you been and how are things going?? Hello Fatima! So nice to hear from you! I am great! 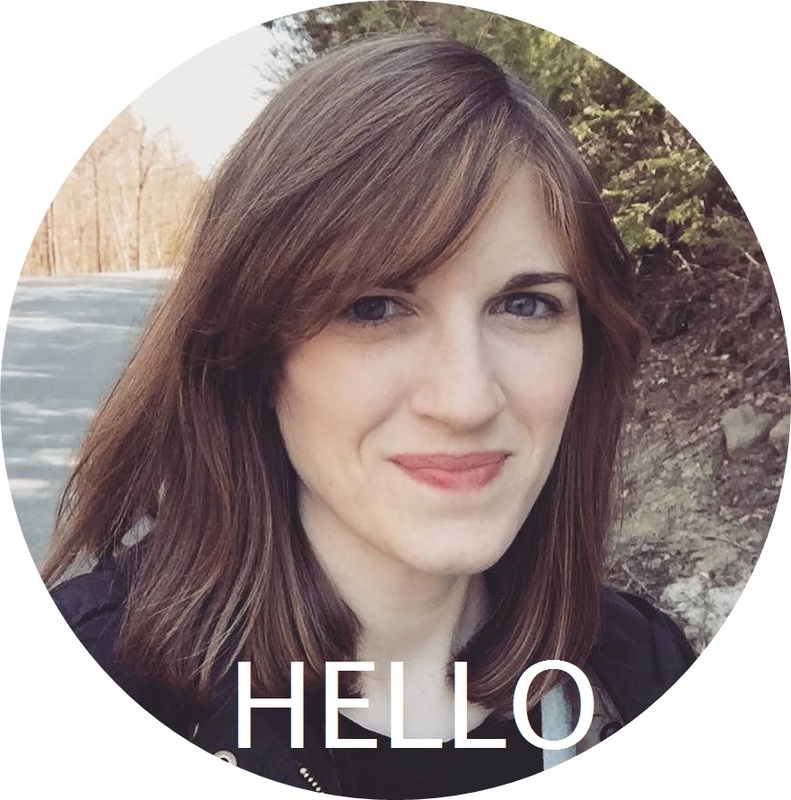 Still living and working in New Hampshire — it was a long winter and I am so glad that spring is finally here! How are you doing? I hope all is well! I’ve also loved watching the show through the lens of what things would have been like for my grandparents and mom. She was born in 1956, so she would have been pretty much the same age as Sally. It’s been fun watching the entire decade of the 60s roll by — can’t imagine how they’re going to wrap things up! You just don’t get any more vintage than this!! OMG, this is the BEST! I remember when desserts like this would always be on the potluck table at church get togethers. Truly vintage, nicely done! This reminds me of something I’d find in my mom’s recipe box. Awesome! Sad that it’s the last season, but I hope they go out with a bang (not like LOST!). I’m so glad I participated in this blog party so I could discover your blog! If there is one thing I love more than New England (and it’s bloggers), it’s a good Jell-O crown. I used to have a podcast called Alphabet Soup where each week, my co-host and I would guess vintage recipes based entirely on the list of ingredients and Jell-O usually made an appearance with meat and/or mayo. Gotta love the mid-century appetite!